A season change, budget problems and a whole lot of script revisions were just some of the things that got in the way of Neil Gaiman's Doctor Who episode. Author, comic book writer, and Doctor Who scribe Neil Gaiman has given fans a glimpse into what it was like writing the script for "The Doctor's Wife," the fourth episode of season six, in a Q&A session for the Guardian newspaper. Gaiman explained that the original idea for the script had been a little different, as the episode was supposed to have been part of season five. The original script saw Amy alone inside the possessed TARDIS, as Rory had been erased from existence at that point in the story arc. The TARDIS also warned the Doctor about the cracks and the big bang, rather than her cryptic comment about "the only water in the forest is the river." As well as the changes necessitated by the season change, some changes had been made for more practical reasons like length or budget. 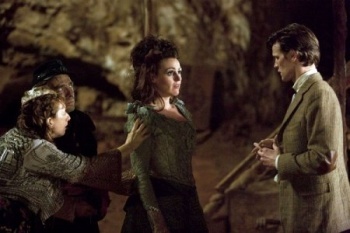 In the original draft, the TARDIS wasn't pulled into Idris' body until much later in the episode, but Gaiman felt that things didn't really get interesting until she did, so he moved it up. Gaiman also wanted to include some other rooms inside the TARDIS, including the oft-mentioned swimming pool, but said that the budget wouldn't stretch to cover them. "Doctor Who can be anything and go anywhere," he said. "And you have to make it up as you go along. And then make it work. And then have people realize your multi-million dollar vision on the equivalent of pocket change." Besides talking about the episode itself, he talked about some of the repercussions that its various story elements might have in the future. He said that he was pleased that his remark about the Corsair being a woman a few times had stayed remained in the script. "The description of the Corsair and the Doctor's relationship with him got shorter and shorter in script after script, but that aside remained, and I'm glad it did, if only because the next time the BBC needs to cast a Doctor, the press and fans get to argue passionately about twice as many actors. He also said that while he intended for the Corsair to remain dead, there was an opportunity there for him/her to come back. Similarly, while House had been thoroughly beaten, he didn't think he'd really been destroyed. "In most of those drafts it was very clear that House had absolutely survived, [but] right now, it's a lot more ambiguous," he said. "But I like disembodied baddies. Something you can't see can be just as scary as things you can. (One of my favorite Doctor Who baddies as a child was the Great Intelligence, and House was as much a tip of the hat to that as it was a steal from Arthur Conan Doyle's "When the World Screamed," and a wave at my friend Harlan Ellison." There are even more answers - and questions for that matter - to be found on the Guardian page itself, and Gaiman said that he might write a blog post about it too, as his time ran out before he could answer all the questions that he wanted. No doubt dedicated Doctor Who fans will be waiting with bated breath.